“It takes a lifetime for someone to discover Greece, but it only takes an instant to fall in love with her”. In just one sentence, the flattering words of American writer Henry Miller managed to capture the essence of Greece. Maybe it’s the allure of the city having been the first capital of modern Greece; maybe it’s the combination of its breath-taking beaches and picturesque alleys; maybe it’s the fact that Nafplio carries the same aesthetic as Athens’ Plaka, only ten folds. Whichever the reason, Nafplio is arguably one of the most striking and romantic cities of Greece, dearly beloved by both locals and visitors, proving Henry Miller’s quote nothing short of true. On its -already excessive- pros list, being only 2 hours away from Athens is pretty high up, making Nafplio, the capital of the regional unit of Argolis, an excellent short getaway destination in Greece. Here, we suggest how to spend two days in Nafplio, the seaport town in the Peloponnese that expands up to the north end of the Argolic Gulf and has managed to capture the hearts of people worldwide. Kick off your first day in Nafplio with a luscious breakfast made with fresh, Greek ingredients, to fuel yourself with the energy you will need for the long day of exploration ahead. From trendy avocado on toast to healthy yogurt and granola bowls, 'Gallika Salon de The & French Bakery' has it all and then some! Its hospitable staff and cozy atmosphere add to its overall merit, making it a must-have culinary experience. Following your breakfast, it is time to infuse your trip with Greek history and culture; both elements that can be found in abundance in Nafplio. Visit two of the most historically significant and culturally emblematic castles in Greece, Palamidi and Akronafplia. Palamidi is built on a high hill in the east of Akronafplia at a height of 216m. It was fortified by the Venetians and resembles a typical Baroque fortress. In 1715, the castle was occupied by the Turks until 1822 when Greeks earned it back. You can access Palamidi either by car or, for the more adventurous, by climbing up the legendary 999 steps from the center of the city (which are actually 857). 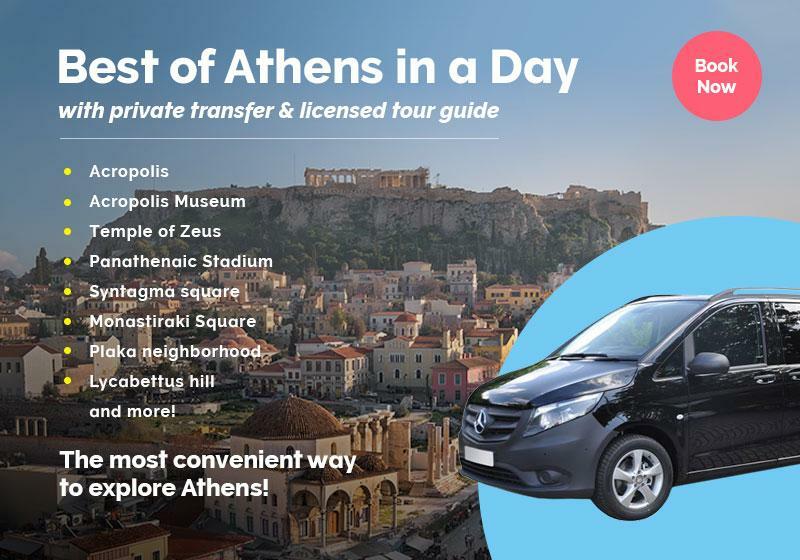 Once you’re there, don’t forget to explore the castle, the Venetian fortress of the early 18th century, St. Andrew's Church, and the prison where national Greek hero Theodoros Kolokotronis was held in 1834. Akronafplia’s castle is on a rocky peninsula that used to be the Acropolis of Nafplion in antiquity. It is accessible only from the north through an artificial historic ravine called Arvanitia. The current form of Akronafplia's castle, albeit quite altered by contemporary interventions, came to be between the 13th and 16th century. Akronafplia, however, carries a much longer history, which is evident through its walls, part of which are cyclopean. In the shadow of Palamidi, right at the base of the infamous 999 steps, one can find Nafplio’s farmer’s market every Wednesday and Saturday, from 7 am to 2.30 pm. Don’t miss the opportunity to browse through the local products and even buy some to taste or take with you back home. After you’ve explored the riches of the Greek land, enjoy a long, unwinding walk along Nafplio’s seaside. The striking view of the sea along with the salty breeze will lull you into a state of complete and utter relaxation; exactly what you need from your weekend getaway. The walk around Arvanitia towards Karathonas bay is about 3 km (one hour) long and it starts from Arvanitia, the edge of the beach, and goes around the rock Akronafplia. By now, your stomach must be rumbling and we can't possibly let this be! Pay a visit to one of the most picturesque taverns of Nafplio, ‘Psiras’, in the districts of Provonia, in a beautiful narrow street at the foothills of Palamidi. 'Psiras' is a family tavern and it also tastes and feels like one! Delicious Greek homemade delicacies wait for you to try them, with the fresh tomato sauce meatballs, crispy pork chops, and mizithra cheese pie being our personal favorites. Good food, delicious local wines, and reasonable prices; you just can't go wrong! After some much-needed rest, get ready to embark on a night adventure in the magnificent city of Nafplio, which reaches fairytale status lit up under the night sky. Since we all agree that all the walking has earned you the right to indulge in dessert, don’t hesitate to grab an ice cream and take a night stroll around the old Parliament of Nafplio, the Syntagma Square and the 'Trianon' theater, finding your way through the city’s narrow streets, where you can also do some souvenir shopping. The popular ice cream shop in Anapli, called ‘Antica Gelateria di Roma’, offers handmade ice cream made from fresh ingredients, rid of nasty fake colors and conservatives. If you’d prefer to go for something a bit more traditional, you can have delicious loukoumades -a traditional doughnut-like Greek dessert- drenched in honey or chocolate at ‘Kentrikon’, located at the central Syntagma square. Your walk around Nafplio’s streets is going to be filled with beautiful scenery and evidence of the city’s rich history. Syntagma Square is the most central and historical square of Nafplion, where you can gaze at important historic buildings, such as the Venetian Warehouse of the Fleet, where Nafplio’s Archaeological Museum, the old Parliament, and ‘Trianon’ theater are housed. ‘Trianon’ is one of the original Ottoman mosques built during the first Ottoman period. Having been used as a mosque, a Christian temple, and the first all-male school in the past, in 1915 it was transformed into a conservatory and theater, and then to a municipal cinema under the name ‘Trianon’. With Nafplio being the cultural center of Argolis, don’t forget to take full advantage of its various events, plays, and concerts. Don’t forget to check out what’s going on at the time of your stay, and enhance your experience in Nafplio through artistic and social stimuli! Tip: To discover Nafplio through the eyes of a local, book a Nafplio walking tour and experience the highlights of the city! Your second day in the city of Nafplio will be just as adventurous and exciting as your first one, so a rich breakfast is once again due. This time, we highly suggest you try ‘Kalimera’. The small, cozy place with a warm atmosphere and a name that means ‘good morning’ in Greek, is definitely worth a visit for breakfast, with only a few tables and a small -yet delicious- traditional Greek menu ensuring a sweet start to your day. After you’ve filled your belly with mouthwatering treats, it’s time for a boat ride to Bourtzi, the Venetian castle located on the islet of Agioi Theodoroi in the middle of the port of Nafplion, about 400 meters from the pier. You can reach the islet easily by boat, which you can find right in front of Nafplio’s port. The boat ride is about 10-minutes long, while the experienced captains are friendly and will generously offer you advice and tips for your trip. Bourtzi ceased to be used as a castle after the arrival of King George I and in 1865 it became the place of residence for the guillotine executioners, something that displeased the locals and caused outrage. In the 1930s the castle was turned into a hotel (sad but true), which resulted in the construction of the monument changing drastically. Further to the damage that Bourtzi has gone through already, it was also bombed during World War II. After the end of World War II, Bourtzi was repaired and -once again- operated as a hotel until 1970. Today, Bourtzi hosts various cultural events while a part of it is regularly used for conference purposes. Tip: The boats leave approximately every 10 minutes and the two-way ticket costs 4.50 €. Following your return from Bourtzi, you can explore the variety of museums Nafplion has to offer. The Koboloi museum in Nafplio is the first-ever museum for worry bead across the world, founded in Nafplio in 1998 by the Evangelinos couple. The museum exhibits consists of a historical collection of worry beads -or koboloi in greek- that have origins in Hindu, Buddhist, Muslim, Catholic, and Greek cultures. The museum’s objective is to conserve the traditional Greek koboloi, having attracted more than 150000 visitors from the day of its establishment. The Museum is housed in a privately-owned two-story building in the old town of Nafplion. The exhibition area is located on the upper floor, while on the ground floor you can find the museum's workshop, as well as the shop of the museum where the works produced in the workshop are sold. The Archaeological Museum of Nafplio is another fascinating museum that’s worth your time. It is housed in an impressive Venetian building, built in 1713, which dominates the western side of Syntagma Square and is one of the best-preserved buildings of the Venetian era in Greece. The most significant exhibit of the museum is the Mycenaean armor of the Dendras dating back to the late 15th century B.C, which is the brightest example of Mycenae weapons that has survived to this day. Last but not least, the Peloponnesian Folklore Foundation will give you insight in both the Greek culture and more specifically the Peloponnesian everyday life across the centuries, along with information on the traditions and customs of the region. The collections of the foundation were set up in 1974 with the initial donation of 6,000 items by Ioanna Papantoniou, while today the exhibit counts 45,000 items directly related to both folk and modern Greek culture. Before heading to your chosen accommodation for a rejuvenating nap, visit Noulis, a meze tavern that is heaven on earth for every foodie out there. Homemade traditional dishes that will leave you stunned to silence, affordable prices and an old-time cook house aesthetic make for an unforgettable Greek gastronomic experience and many great memories for you to take back home. Alternatively, you can choose to experience the Greek cuisine first-hand and join a private cooking class in Nafplio, where you’ll have the opportunity to cook traditional local dishes and educate yourself on the Greek cooking culture. Your last night at Nafplio should be as laid-back as it gets. Therefore, leave behind your curious nature and the long, tiring walks, and enjoy a drink -or two- either at Nafplio’ port with a view of the lit-up, beautiful as ever, Bourtzi, or at Syntagma Square, where the heart of the social life of Nafplio beats. 'Mediterraneo wine & Deli' is an excellent wine bar, where you can enjoy a wide selection of local varieties of wine. Hidden in a narrow, picturesque alley, 'Mediterraneo wine & Deli' offers the services of an experienced sommelier along with a selection of local, high-quality cheeses and cold meats in a unique, visually-aesthetic environment! If wine is not your thing, opt for 'Black Cat', one of our favorite bars and not just because it has a resident ‘pub cat’ often found sleeping on the counter. Its tasteful decor and friendly staff contribute to its inviting quality, while the delicious cocktails and good music contribute to its visitors always having an excellent time! Due to its close proximity to Athens and its unmatched beauty, Nafplio is one of the best weekend getaway destinations you can find in Greece, with tons of things to do and see. Hurry up and book a trip to the majestic Nafplio; you won't regret it!